would love a good jumbo and a good 0 size guitar as well, but its not a priority, as this guitar meets most of my acoustic needs. love the 1 13/16 nutwith. A few weeks ago I added a forum 3 to the others. It's a non-numbered one with spruce/rosewood that I bought from a gent in Seattle. Might anyone here be the original owmer? Here it is. I'm very pleased with it. There were about 10 or so non-numbered made. Danny likely has that detailed info. Around here I think at least Denis and Ricky had non-numbered Forum III's, some were lefties like our friend Mike in Vancouver had one and some were hog. It's a beauty no doubt about that!! Well, I've now owned four Larrivees, all wonderful! Have kept two. First one was my first really nice guitar - a DV-05e. I was looking for a nice acoustic, and stumbled on this on our local craigslist. Now that I think of it, I have picked up all four off CL. Well, I was very new to playing, not really sure what I was looking for, but I went over to check this out. It overwhelmed me how nice it was to play, and how good it sounded! Easy purchase, but it opened my eyes to nice instruments, and has thus cost me a great deal of money over the past few years!!! This guitar just moved on to a friend who fell in love with it the moment I showed it to him - he bought it from me last week to fund my latest purchase (thread to follow in next couple of days). My next Larrivee was a D-02 that I picked up simply because it was too good a deal to pass up - it was built in 12/99, and had barely been played! With a spotless TKL case, it only cost me $200!!! I would've kept that one forever, but my fiancee's cousin was looking for a reasonably priced acoustic (HS student), so I sold it to him. Might just buy it back at some point, it is a really nice guitar. My third Larri is a P-03 that I still have. Wow is all I can say, love it!!! 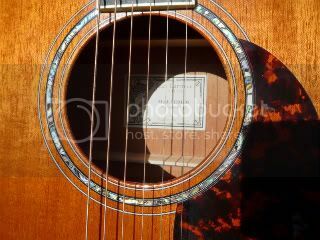 Though it was used, it had hardly been played by its first owner, and was in pristine condition when I got it. Still is, and I love it to death. My most recent addition I was able to fun by selling my DV-05e to my friend - an LV-09. What a guitar! I have only had it for a few days, and have only had a couple of hours to play it, but it is my best one, which says a lot! I am excited to get to know this one better. Pics soon in another thread. Congrats on your LV-09 - they are incredible guitars indeed (I owned one for awhile - it sounded incredible, but gas struck and I sold it ). I now have the nearly identical C-10, and it is indeed my best sounding Larrivee, even though it's new (personal opinion, of course). What a list of explorations. I miss a lot of them, but sold them to purchase others. The usual. D10 keeper - got it used, banged up. Had it set up and frets shaped up. Now it is amazing. I'd like to try an OO model some day or a 50,60. I kept trying P (and PV) -09's, but I never found one that I liked. They were great guitars, just not the sound I wanted. I just restrung my J-09 last night. It sure sounds different! I also have a 00-70. I'd kind of like to find a 000-50. My former guitars are a Forum 1, two forum 3, and a JV-05e.